Burn Nico Videos to DVD/Blu-ray disc, DVD menu, Nico Video Burner. Nico Video is a popular video sharing website in Japan managed by Niwango. In this webiste users can upload, share, and view videos. Unlike other video sharing sites, however, comments are overlaid directly onto the video, synced to a specific playback time. This allows comments to respond directly to events occurring in the video, in sync with the viewer - creating a sense of a shared watching experience. Maybe some people prefer enjoy Nico Videos on TV system. So they need to burn Nico Videos to DVD or Blu-ray disc. But how to burn the funning Nico Videos to DVD or blu-ray disc? Here our programs can help you burn your desired Nico Videos to DVD. Any Video Converter and Any DVD Converter Professional feature a new characteristic: both of them can burn Nico video to DVD with DVD Menu. Here the following is a brief guide on how to burn Nico video to DVD/Blu-ray disc. Step 1 : Add/Download Nico video to the program. If you have downloaded the Nico Videos from the website and saved in your computer disc, you just need click Add Video button or go to menu File > Add Video Files to select your desired video clips from your hard drive. But if you do not download the Nico Videos, with Any Video/DVD Converter, you can download videos from Internet and then burn it to Blu-ray disc. Firstly, you need to visit Nico.com and right-click on the desired video to choose Copy Link Location (this is for Firefox users) or open the video and then copy the URL from the navigation bar (this is for IE users). 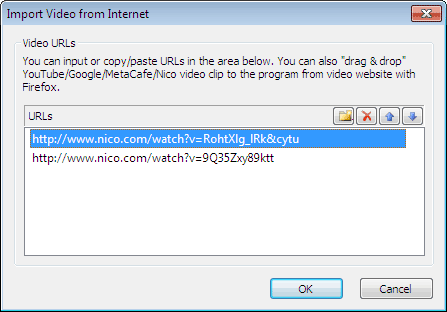 Secondly, you can click online video download button to begin download Nico directly. After you have downloaded the Nico Videos, all of them will be displayed on the middle panel with their detailed information, including duration, format and size, etc. Note: If you want to burn video to AVCHD DVD, please refer to the guide on how to burn video to AVCHD DVD. 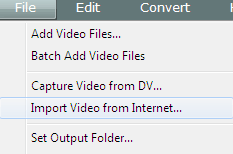 Step 3 : Click Convert button to start encoding Nico Videos. 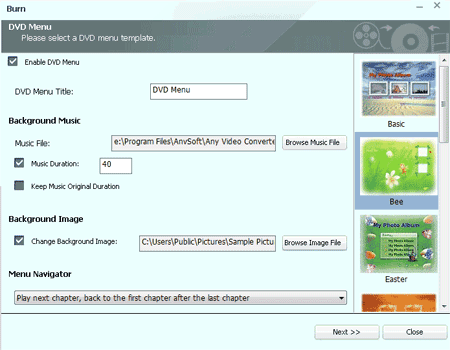 You will be prompted to choose DVD Menu when the program finishes Nico video conversion process. 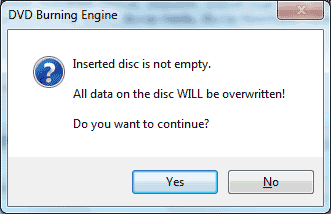 After the program finish to burn Nico video to DVD, it will pop up a DVD Burning Engine to congratulate you that your disc has been successfully burned. Now your Nico video have been burned successfully to DVD/Blu-ray disc, just have fun!